S. I. 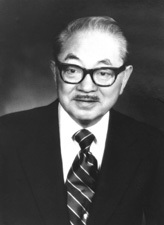 (Sam) Hayakawa (Samuel Ichiye Hayakawa) was a Republican United States Senator from California; born in Vancouver, British Columbia, Canada, July 18, 1906, of Japanese immigrant parents, Ichiro and Toro Hayakawa. He died February 27, 1992 in Greenbrae, California, at the age of 85. He is best known for his popular writings on semantics and for his career as Professor and President of San Francisco State College (now San Francisco State University). He was a world-renowned (perhaps the pre-eminent) semanticist, studying the history of language patterns and habits of thought. He wrote several internationally acclaimed books on semantics, including Language in Thought and Action, now in its sixth edition. He served as Associate Editor of many encyclopedias. In 1950, Hayakawa became a lecturer/Professor at the University of Chicago. Hayakawa produced a series of TV shows on semantics for National Education Television, while working in Chicago, increasing the awareness of linguistic issues within the academic community, and the general public at large. On radio, Hayakawa also conducted a series of lectures on another favorite pastime of his: Jazz. Hayakawa was an authoritative expert on language, and also a strong believer that English should be the official language of the United States. In 1981, he proposed an amendment to the U.S. Constitution that would achieve this. In 1983, along with Dr. John Tanton he founded an organization called U.S. English that supported English-only legislation. Administrator: President, San Francisco State College (1968–73) becoming President Emeritus in 1973. U.S. Senator, California 3-Jan-1977 to 3-Jan-1983 (Republican) Elected in 1976, and subsequently appointed on January 2, 1977, to fill the vacancy caused by the resignation of John V. Tunney, and served from January 2, 1977, to January 3, 1983; was not a candidate for reelection in 1982. Karagueuzian, Dikran. Blow It Up! The Black Student Revolt at San Francisco State College and the Emergence of Dr. Hayakawa. Boston: Gambit, 1971. Hayakawa, S.I. Choose the Right Word: A Modern Guide to Synonyms and Related Words. 1968. Reprint. New York: Perennial Library, 1987. Originally published as Funk & Wagnalls Modern Guide to Synonyms and Related Words. “Education Revisited.” In The World Today, edited by Phineas J. Sparer. Memphis: Memphis State University Press, 1975. Language in Thought and Action. 1939. Enlarged ed. San Diego: Harcourt Brace Jovanovich, 1978. Originally published as Language in Action. Symbol, Status, and Personality. New York: Harcourt, Brace & World, 1963. Through the Communication Barrier: On Speaking, Listening, and Understanding. Edited by Arthur Chandler. New York: Harper & Row, 1979. Language, Meaning, and Maturity. New York: Harper & Brothers, 1954. Our Language and Our World. 1959. Reprint. Freeport, NY: Books for Libraries Press, 1971. The Use and Misuse of Language. Greenwich, CT: Fawcett Publications, 1964. Paris, Richard, and Janet Brown, eds. Quotations from Chairman S.I. Hayakawa. San Francisco: n.p., 1969. *Hoover Institution on War, Revolution and Peace, Archives, Stanford, CA. Papers: 1977-1988. 385 manuscript boxes, 35 cubic foot boxes, 36 card file boxes, and 7 oversize boxes. Correspondence, memoranda, reports, documents, clippings, other printed matter, photographs, audiotapes, videotapes, and memorabilia relating to many aspects of American foreign relations and domestic policies. Papers: Correspondence in Adolph Frederick Reinhardt papers, 1930-1967, available on 5 microfilm reels. This page was last modified on 26 September 2018, at 14:46.